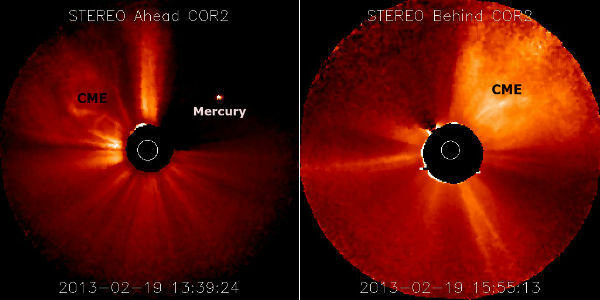 Sun erupted slow-moving Coronal Mass Ejection (CME) on February 19, 2013. Goddard Space Flight Center reported that the bulk of the plasma cloud was directed to the north of Earth. Still, we can expect a glancing blow around February 22, 2013. Minor to moderate geomagnetic disturbances will be possible at very high latitudes backed by aurora displays. NOAA/SWPC forecasters estimate 55% chances for M-class and 15% chances for X-class solar flare eruptions. The geomagnetic field is expected to be at quiet to active levels on February 20, quiet to unsettled levels on February 21 and quiet levels on February 23, 2013. Protons have a slight chance (15%) of crossing threshold in the coming days. Solar winds flowing from large sinuous coronal hole could reach Earth as early as February 21, 2013. New Sunspot 1678 produced only B-class and C-class solar flares by now, however, this fast growing region continues to form to the southeast of Active Region 1671 and may produce an isolated M-Class, even X-class event, within the next 24-48 hours depending on development. AR 1678 developed beta magnetic complexity with mixed fields. Active Region 1678 is currently larger than three Earths. This video bellow by SDO shows the formation of this region from February 17 through part of February 19, 2013. 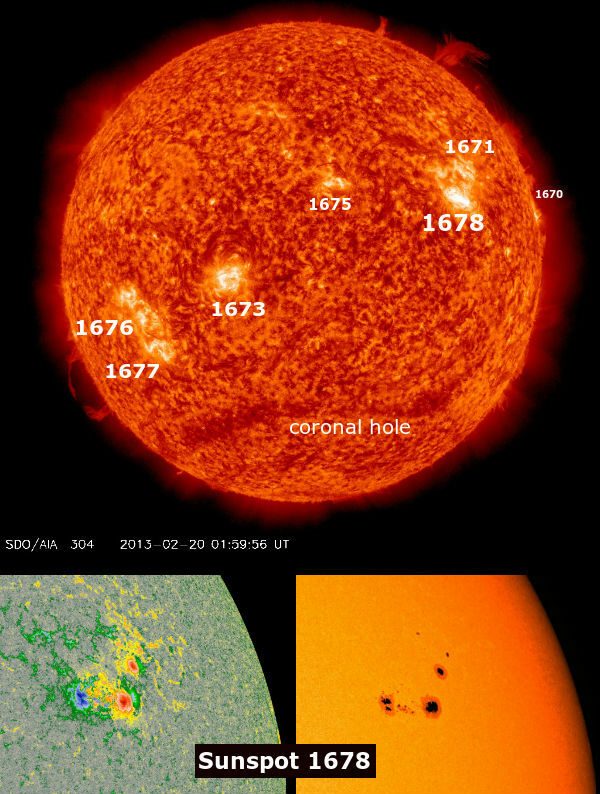 The largest solar event in the past 24 hours was a C2.2 event observed from Region 1678. NOAA numbered 7 sunspot regions on the disk and SIDC/Catania counted 9 active regions. All regions are currently stable. This should be an interesting Friday.